The late John Steadman, a columnist for the Sun who wrote about the playing fields and people of Baltimore for a half-century, is the winner of the 2001 Red Smith Award for major contributions to sports journalism. Steadman, who wrote a column for the Sun until only weeks before his death Jan. 1 at 73, is the 21st recipient of the award. 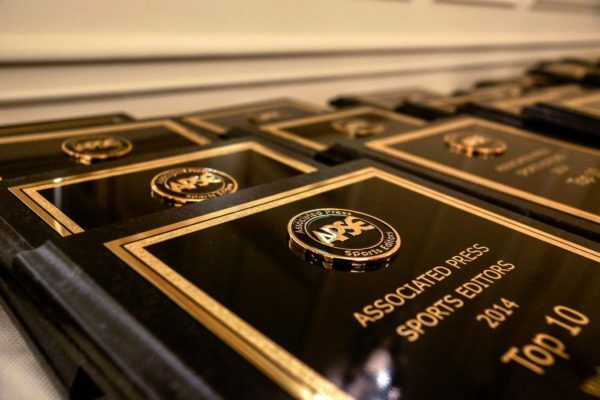 It is bestowed by the Associated Press Sports Editors in honor of the late Walter (Red) Smith, Pulitzer Prize-winning New York reporter and columnist. "It’s as big an award as one can get," said Dave Smith of the Dallas Morning News, a former APSE president, Red Smith Award winner and chair of the award committee. Former presidents and previous winners participate in the balloting. This year 11 journalists were nominated by APSE members through region chairs and former presidents. "John was the eyes and conscience of Baltimore for more than 50 years," Dave Smith said. "He believed what he wrote, and his columns reflected that passion." After graduating from high school in Baltimore, Steadman began his career at the Baltimore News-Post in 1945. From 1954 to 1957, he worked in management for the Baltimore Colts. He returned to the News-Post (which was later renamed the News American), became sports editor and remained until it folded in 1986. He joined the Evening Sun as a columnist and, in 1995, went to the Sun upon the demise of the Evening Sun. His final piece appeared Dec. 3, 2000. To that date, he had attended every game played by the Colts and later by the Ravens – 719. He died of cancer New Year’s Day. "This [award] speaks to John’s career at a time when it should be spoken to," said Bill Dwyre of the Los Angeles Times, a former APSE president and a Red Smith Award winner, who nominated him. "To do something, and to do it well for a long time, has always impressed me. John was a 50-year wonder." In the voting, Steadman outpolled the late Jimmy Cannon, columnist for the old New York Journal-American, and George Solomon, assistant managing editor of the Washington Post. "John was my No. 1 choice," said Sam Lacy, sports editor of the Baltimore Afro-American, who had won the award in 1998. "He had a humane quality unmatched by most writers." When Steadman died in January, John Eisenberg, a Sun colleague, summed up his career this way: "No issue was settled … until he had weighed in. For 40 years, what [Steadman] said about sports in Baltimore mattered more than what anyone else said." Other colleagues expressed similar sentiments. "Reading his work, or just talking with John, was a privilege," said William K. Marimow, editor of the Sun. "He is up there where the air is rare, in terms of excellence." "There was a father-and-son baseball game, and Mr. Kuhn, who used to sing ‘Hinky Dinky Parley Voo,’ lost his pipe chasing a ball hit over his head in center field. "Frank Doyle and Reds Conroy stowed away on the Norfolk Bay boat and were reported missing overnight. What happened when they got home still hasn’t been learned, but they weren’t seen for two weeks – except in church on Sunday. "All the girls had taken a shine to Norbert (Itch) Zeller, who could deliver his newspaper route faster than Billy (Stinky) Treadwell could run from the cops when they came to chase him for playing on top of the Wilsby Ave. garages. "Yes, the good ole days … when nobody knew where Pearl Harbor was – or Saigon, or anyplace else that wasn’t in the International League." APSE’s Red Smith Award would have embarrassed Steadman, family members said. "He would have thought Red Smith was above him and that he wasn’t worthy of such accolades, being – as he put it – ‘a broken-down sports writer,’ " said his brother, Tom Steadman, of Ellicott City, Md. "John would have been overwhelmed," said his wife, Mary Lee, of Stevensville, Md. "He’d say, ‘I didn’t deserve it’ … but he’d have been pleased." Steadman’s family will accept in his honor at the APSE convention’s Red Smith Award luncheon Friday, June 29, in Baltimore.